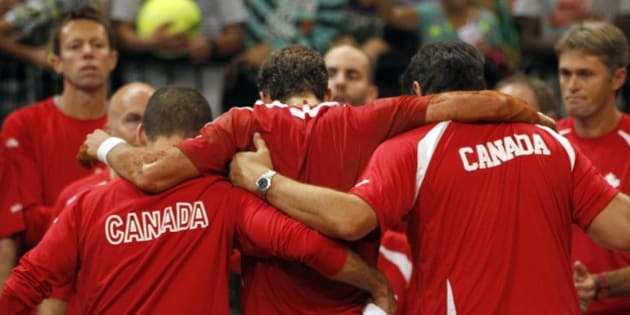 BELGRADE, Serbia - Canada limped out of the 2013 Davis Cup semifinal with three losses to Serbia, and two bruised bodies. The Canadian team's Davis Cup run came to an end Sunday as Janko Tipsarevic beat Vasek Pospisil 7-6 (3), 6-2, 7-6 (6), giving Serbia the 3-2 win in the best-of-five tie. Pospisil was injured on the final point when he dove to hit a volley that was returned for the final point. "I went for a volley and rolled my ankle and hear some pops which obviously isn't good but that was it," said Pospisil who was helped into the post-match press conference by Canadian staff members. "My ankle's swollen right now. Hopefully it's nothing too serious. "The fact that I was able to walk out of there was probably a good thing." Tipsarevic took a commanding 5-1 lead in the decisive tiebreak but had trouble closing out the game until match point when he desperately dove for Pospisil's shot. The euphoria for the hosts started when the ball just barely made it over the net and past a helpless Pospisil. Had he won the point and the match continued, Pospisil insists he would have played through the pain as best as possible. Canada's run to the semifinals featured upset wins over Spain and Italy and with the 23-year old Pospisil, 22-year old Milos Raonic, and doubles maestro Daniel Nestor who insists he still has a few years left despite being 41-years old, there is the core of a strong Davis Cup team for years to come. "Hopefully they'll have to deal with us a lot in the future," Pospisil said. "We're a pretty young team so that's obviously good for us. We have Milos who's 11 in the world and I'm around 40 so that's good for us. "We have a lot of depth in the team and a bunch of other guys that are really good. We'll see what we can do in the future." As it was in the tiebreak, so it was earlier in the final set when Tipsarevic had difficulty closing out the plucky Canadian. Tipsarevic broke Pospisil in the fourth game of the third set but faltered while serving for the match and allowed Pospisil to tie the set 5-5, giving the Canadian a glimmer of hope. Pospisil needed treatment at 2-2 in the first set for an apparent right elbow injury. He insisted it was only a mild discomfort that lasted for about 10 minutes. It was the third match of the weekend for Pospisil after he opened the tie losing to Novak Djokovic on Friday before being part of the doubles team that won on Saturday. Tipsarevic effectively kept Pospisil on the run in a number of long, baseline rallies. Serbia is back in the final for the first time since winning the tournament in 2010. Earlier, world No. 1 Novak Djokovic forced the decider when he took down No. 11 Milos Raonic 7-6 (1), 6-2, 6-2 in the first match of the day at Kombank Arena. Raonic, of Thornhill, Ont., came in with a slight ankle injury of his own that he picked up in his win over Tipsarevic on Friday. "I didn't feel limited. I just felt like I was dealing with discomfort," said Raonic in his post-match press conference. "It was getting worse and worse, little by little and I was sort of trying to put it all out there and fight through that situation as much as I could and try to pretty much nullify it in my mind and get through as much as I can." Djokovic finished the two hour, eight minute long match with some sublime shot-making in the third set. Djokovic flourished on the clay court, a surface on which Raonic has had his struggles. It was a close first set that took just over an hour with the players trading breaks in the fifth and sixth games before Djokovic took control early in the tiebreaker. "I think I made one mistake on that tiebreak to make it 5-0. So I didn't really make too many terrible errors," said Raonic. "I wish I could have not kept falling behind first. I did get break him twice but it was always when I was behind." The second was much more comfortable with Raonic getting broken in the fourth and sixth games. The small bastion of Canadian support had been loud all weekend but Djokovic used the home crowd to his advantage when Raonic had a chance to break in the fourth game of the second set. Djokovic fought off double break point and when he got back to deuce, he threw his hands into the air, imploring his compatriots to make themselves heard. They were more than happy to help, and when Djokovic won the game, he reacted with a big fist pump. The top eight teams get an automatic berth in the 2014 Davis Cup world group. Canada finds out who they play in January's first round on Wednesday.